2018-03-29T07:07Z | by Jan K.
If you’ve been searching for the best roulette strategy online, you almost certainly have come across many websites that claim that their strategies are a surefire way to make money online. However, these strategies really don’t work. If you keep using them on a long-term basis, you will almost certainly lose your entire bankroll. I use the term "scam roulette strategies" to describe these strategies. In fact, I’ve dedicated an entire article to scam roulette strategies. Read it now to find out which strategies I’m talking about and why they don’t work. Everything in this article is supported by simulations. The strategies in this article are different. I am not saying they will help you turn roulette into a cash machine. That’s not possible, because the casino always has a statistical advantage over you when playing roulette. You statistically lose money with every bet you make, which is why any attempt to systematically win on roulette is not possible, with the exception of some of the cases described in my how to beat roulette article. However, that doesn’t mean you can’t do your utmost to play roulette effectively, and have a realistic chance to win money and enjoy the game at the same time. Keep reading this article and discover the strategies I consider to be the best. Why can higher volatility help you win more? What is the best strategy for players that want to have fun? What is the best strategy for players that want to win big? And can you have both at the same time? There is one thing I’d like to point out before we discuss the strategies themselves. If you’ve read some of the other articles on this website, you will already know how much I underline the importance of volatility (also known as variance). The game of roulette is quite simple and enables us to easily demonstrate why volatility matters. High volatility means that you will not win very often, but the individual wins will be larger in order to compensate for this. Low volatility means the opposite. You will win quite often, but the individual wins will generally be small. Medium volatility is somewhere in between. The most volatile bet you can place on roulette is a bet on a single number (Straight up). It has a payout ratio of 36-times your bet and you statistically will only win once every 37 spins (on a single-zero roulette wheel). Actually, this isn’t that volatile. Slots, for example, can be much more volatile than this. In terms of roulette, however, this can be classified as "high volatility", or at least the highest you can get for a single spin. In terms of low volatility, the least volatile "standard" bets are known as even chance bets that pay 2-times your original bet and have an 18:37 chance of winning. These are bets placed on red/black, even/odd, high/low. Technically, you can achieve less volatility by covering a substantial part of roulette table with chips, but let’s stick with this bet for now as an example of low volatility. As you may already know, the expected return to player (RTP) of any type of roulette bet is the same. The RTP of American roulette is 94.74%, whereas the RTP of European roulette is 97.3%. This means that you statistically get the same percentage of your money back, regardless of which type of bet you place. In reality, all bets are not the same. In American roulette there is a bet called "Top line" that has an RTP of only 92.1%. But let’s ignore this for now to make it a bit simpler. And you wouldn’t place any chips on that bet anyway. If you want to know more about various types of bets, read my article about roulette rules, odds, bets and payouts. This doesn’t mean, however, that you should simply place bets without thinking about them, because volatility really does matter. Let me explain further. You must remember that the RTP of roulette is always less than 100%, which means that you are always statistically losing your money. If you place bets with low volatility, your results will stay close to the expected outcome, which is negative for you. However, when you place highly volatile bets, you have a higher chance to deviate from the negative expected results and actually end up winning some money, even though you are statistically still expected to lose. This concept might be a bit difficult to grasp, but the charts below will hopefully help you to understand why high volatility is generally better for the player. 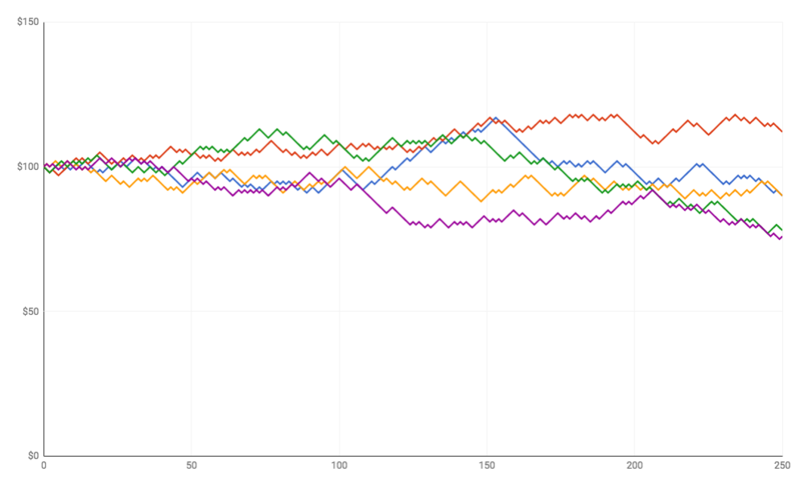 As you can see, all of the five players who placed low volatility bets stayed close to their starting bankroll and the expected negative return. Only one of them ended up winning any money, with the other four finishing with around 80% to 90% of their initial bankroll. In terms of players placing high volatility bets, the results were much more interesting. One of them lost everything after 136 spins, and another came very close to going bankrupt, but one player was pretty much break-even, and two managed to win nice amounts. This demonstrates that in order to have a chance to win big, you pretty much need to increase the volatility. I hope these charts, together with what I have written above, will make it clear why the best strategies in terms of expected value are generally the ones that consist of placing higher volatility bets. Now let’s get to the strategies themselves. You could go to a roulette table with $100 and keep betting $1 on black. You could spend hours playing like this, but you will definitely not win any substantial amounts of money, and you will very likely end up losing at least part of your bankroll. And because your bets are so small, the game will probably not be very thrilling for you. Or you can take the entire $100 and place it on a single number. You have a chance of winning $3600, but you will very likely lose everything in a single bet. This strategy is very exciting and has a very high expected return, but it’s very volatile and your play time will be very short. Let me present you with some of the best roulette strategies I could come up with or find. Choose the one that’s best for you based on your personal preferences. Keep in mind that these strategies are not miracle workers, however. They will not help you to win every time. They are designed to help you enjoy the game of roulette, while maximizing the aforementioned priorities. I just want to make this completely clear before I move on to the strategies themselves. Note: I will go into the statistical details for each of the strategies, even though I appreciate that some of you don’t care too much about this topic. That’s why I will only provide basic information for these strategies, in addition to posting links to individual articles with more details and simulations. This will allow you to read the basics and skip the rest, but if you do happen to be interested in this topic, you will most likely enjoy discovering the details as well. I decided to include this strategy as the "standard" way to play roulette, mostly so that I have something to compare the rest of the strategies to. It’s not an entirely bad strategy though. It all depends on what kind of bets you place, how big (or small) the bets are, how long you want to play, and/or how much money you would like to win. A player walks into a casino with $100 in their pocket and then sits down at a roulette table. The minimum bet is $10 and they start betting $10 on black every single round. They want to have fun playing roulette for an hour or so, or double their bankroll and leave with a potential profit. This is a great example of the Constant bet strategy. Do you want to spend an hour playing roulette and have a reasonable chance of ending up with more money than you started with? The Constant Bet strategy might be ideal for you. Do you want to double your bankroll? This can also be achieved using the Constant Bet strategy. Do you want to win big? You might somehow manage to do this using this strategy, but there are better options for you. These are just the basic details. I go into much more detail in the separate article covering the Constant Bet strategy. Feel free to click the link and peruse the article, but I advise you to read the basics of the other strategies first, so that you can get a full picture before getting into the specifics. I will add links to the separate articles later on as well. The Constant Proportion strategy is very similar to the aforementioned Constant Bet strategy, but instead of placing bets at constant amounts, your bet size will remain equal to a certain percentage of your bankroll. Let’s take a look at an example. Let’s say a player has a $100 bankroll and wants to place 10% on a specific color in each round of the game. In the first round, they place a bet of $10 (10% of $100) and win. His new bankroll is $110, so in the next round he wagers $11 (10% of $110). He continues like this until he wins a satisfying amount, loses everything or simply choses to stop playing. As already mentioned, this strategy is very similar to the Constant Bet strategy, but with one extra element to it. If you keep winning, your bets will increase, which makes it easier to win big. On the other hand, if you keep losing, your bets will decrease, which means you will lose at a slower pace. This self-regulating mechanism makes the Constant Proportion strategy a bit more interesting than the Constant Bet strategy, at least in my opinion. More information about the Constant Proportion strategy, including a number of simulations that show how it performs in real-life scenarios, can be found in the separate article about the Constant Proportion strategy. As you can probably tell from the name of this roulette strategy, it’s about going all-in. It’s an extremely volatile strategy, which means there’s a great chance of losing your entire bankroll in just one round. In spite of this, it retains the highest expected return of all the strategies mentioned in this article, and possibly the highest roulette-based return you could ever hope to win with any given bankroll. If you start with $100 and want to end up with at least $1,000, you should place your $100 on a row (3 numbers). If you win, you will have $1,200, and you can happily stop playing. If you start with $100 and want to end up with at least $3,000, you should make a single $100 bet on a random roulette number. If you win you will have $3,600, turning your goal into a reality. If you start with $100 and want to have at least $10,000, one bet will not be enough for you. However, what you could do is start off with the same bet mentioned in the example #2, but then place another bet of $3,600 on a column or a dozen, on the basis of the first bet being successful. If you win both bets, you will end up with $10,800, and you can happily stop playing. This strategy also has a major drawback, however, in addition to its extremely high volatility. The play time for this strategy is virtually non-existent. You will most likely have only one spin, or a couple more if you are lucky (and your target win is really ambitious), which is why this strategy is not recommended for players who want to enjoy the game of roulette for a bit longer while they "go through" their bankroll. As in all my strategies, I’ve written a separate article about the All-in roulette strategy, which contains all the necessary statistical details to understand it properly. The Reverse Martingale strategy is very interesting for many reasons. You have a really fair chance of winning big while also enjoying the game for a reasonable amount of time, as well as it being relatively easy to predict. This strategy is a great fit for many people, as it can offer a nice balance between a decent expected value, the chance of winning big, major thrills, and extensive playing time. You might have heard about this very well-known strategy known as Martingale, which consists of placing a single even-chance bet, and then doubling the wagered amount every time you lose. However, this doesn’t really work. You can read more about this strategy and take a look at the simulations that prove why it doesn’t work, in my article about scam roulette strategies. The Martingale strategy essentially consists of increasing the size of your bet whenever you lose. The Reverse Martingale strategy is the opposite. You increase your bet every time you WIN. This enables you to transform a random series of lucky spins into huge possible wins. Here is an example to show you how this strategy works. Imagine a player starting off with a $100 bankroll, who begins by betting $1 on any number on the roulette table. If they lose, they bet $1 again. If they win, they take the amount they initially won ($36), then wager it again by placing a $36 bet on a random number. If they win this $36 bet, they happily collect their money ($1,296) and leave the table, or keep betting again with an initial $1 to have a chance of winning once again. If they lose, they go back to the first step of $1 and begin again from there. or they manage to win two bets in a row, collect their winnings of $1,296, and keep the portion of their bankroll they haven’t yet wagered, or they can choose to continue, "play through" the remaining portion of their bankroll and possibly win another $1,296. The outcome of this strategy will vary enormously, depending on the percentage of the bankroll you wish to wager as your initial bet, and the satisfying amount you aim to win. I go into everything in more detail in the separate article about the Reverse Martingale strategy. Read it and find out why I think this strategy really is the best way to play roulette. The Progressive Bet roulette strategy was created as a spin-off to the aforementioned Reverse Martingale strategy. While the Reverse Martingale strategy is mathematically great, I believe it might not be the preferred choice for many players who don’t like the idea of placing the entire win from previous spins in a single bet, or something else about the strategy. The Progressive Bet strategy is also based on increasing bet sizes after a win, but not as much. Instead of wagering the entire amount of your winnings at once, this strategy works by wagering only a portion of what you won in the previous round. 1. The player places a Corner bet of $2. They have a 4/37 chance of winning $18 (including their initial stake). 2. If they win, they then place a bet of $12 (2/3 of $18) for a chance to win $108. 3. If they win again, they then place a bet of $72 (2/3 of $108) for a chance to win $648. They can continue like this until they lose, or win a sum of money they prefer not to wager anymore. 4. Whenever they lose, they go back to the initial bet of $2 and continue from there. I did not choose this example by accident. 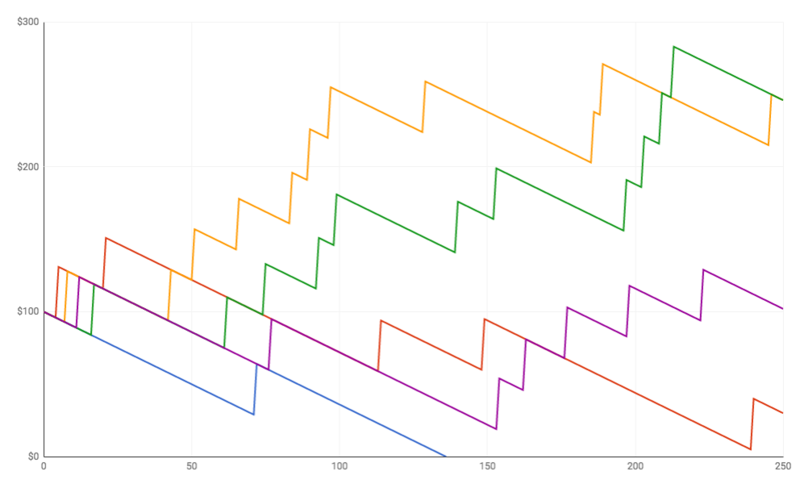 It is, in fact, one of the most interesting options out of the 27 different combinations of bet types, basic bet sizes and multiplication factors (2/3 in this example) that I tested in my simulations, which you can find in a separate article about the Progressive Bet strategy. There are some very important differences between the Progressive Bet strategy and the Reverse Martingale strategy. in the latter strategy, there were only two possible outcomes - either you reached the target value (or even exceeded it) or lost everything. The Progressive Bet strategy enables a wider variety of results. You could lose only a part of your money, or you could end up with a slight profit. And you could even win big, provided that you choose a good combination of factors as mentioned above. What’s more, we tend to choose less volatile betting types for this strategy, meaning we get to place more bets of higher sizes, which makes the gameplay more enjoyable for certain players. If this sounds interesting to you, make sure to check out the Progressive Bet strategy and find out even more. In each of these articles, you can find detailed explanations about each of the strategies, as well as simulations and calculations that clearly show how they behave in real-life situations. If you want to know absolutely everything about my strategies, I suggest you read the articles linked above or at least those which interested you. As already mentioned, there is no single strategy that’s suitable for everybody. Each player has their own roulette strategy, including their advantages and disadvantages. I could simply tell you to read the individual articles and find out more, but I will try to sum things up and give you some recommendations on the basis of not everyone wanting to get into specifics. The Constant Bet strategy can be used in all situations, as well as being very flexible and extremely easy to use, but it won’t give you really big wins. The possibility of winning big also increases the chances of running out of money prematurely. The Constant Proportion strategy is a bit more balanced thanks to its self-regulating mechanism of changing bet sizes, but it’s a bit more difficult to use because you have to calculate the proper bet size in each game round. You should be able to do this pretty much automatically after a while though. The All-in strategy has the potential to deliver huge wins but is also extremely risky, overly volatile, and likely to give you just one or two spins, so play time is not ideal to say the least. The Reverse Martingale strategy is the best strategy n my opinion. It has a predictable amount of play time, offers a fair chance to win really big, and has great expected value. However, this is not suitable for live play in most cases due to the basic bet size needing to be small (unless you have a really big budget), which is a problem because of the bet size limits of land-based casinos. The Progressive Bet strategy is also a great option, especially for players who might not enjoy the need to wager the entire winnings from the previous game, while also maintaining a good chance to win big. In order to do this, good parameters must be chosen, so please make sure to read the entire article to find out more. Whatever you end up choosing, always keep in mind that roulette is a game with negative expected value for the players, which means you will always lose money over the long-run. My strategies are not a miracle way to remove the edge enjoyed by the house, but to minimize its effect on your bankroll. If you find some of the strategies particularly interesting, be sure to read its accompanying in-depth article to fully understand the details before trying it out. And if you decide to give it a try in a real casino, good luck at the tables!